Time-saving design for easy loading of documents- no tools required. 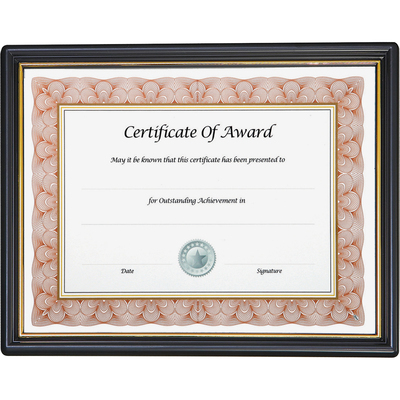 Display awards or certificates horizontally or vertically. Economy plastic frame with unbreakable plastic face. Traditional round-profile design. Easy-slide material insertion saves time when loading. Simply flex, open and slide to quickly load your document, award, certificate or photograph. Economical plastic frame features an unbreakable plastic face to protect documents. Frame may be mounted with either a portrait or landscape orientation. Available with or without gold-trim.